Many people are drawn to the idea of a get rich quick scheme. The reason is fairly obvious. These schemes are supposed to offer the opportunity for quick money, and a lot of it. Yet the vast majority of these plans fall through, and people are left wondering what went wrong. The fact of the matter is that these get rich quick schemes are literally designed to fail. Although there are more reasons, here is a quick glance at some of the main reasons these plans fall through. “Rome wasn’t built in a day.” In fact, it wasn’t even built in a couple of days, or even a couple of months. To build anything substantial or worthwhile, you have to invest enough time into it. Without enough time you will never have anything substantial. The money you may be able to make will be gone as soon as you spend it, without hopes of earning more. If you want to be successful and earn a substantial amount of money, you have to spend a lot of effort. You don’t get rich by doing almost nothing. It takes years of dedication and hard work in order to amount to anything. Without this, you are only setting yourself up to fail. A lot of get rich quick schemes are designed to cheat the system. This will fail utterly. Not only because they are illegal, but because they all eventually be shut down. You have to play by the rules if you want to create any kind of real support or success for yourself. The get rich quick schemes you hear about on the television, the radio, the internet, or in the mail are not usually designed to succeed. They are designed to cheat you out of your hard earned money. Too many people fall victim to these plans because they only see the smoke and mirrors. Yet that is all they are: smoke and mirrors. Underneath there is nothing substantial. If you take the time to think about it, research it, and look it over, you will see that for yourself before falling victim to the cons running these masquerades. If something promises you wealth within a short period of time, avoid it. Never send a stranger money through Moneygram or other money sending services. You should not have to pay someone to make money for yourself. If someone asks you to send them money- even a small sum- in order to start making money yourself, it is a fraud. Remember that the best plans on getting ‘rich’ or being successful take a lot of work and time. 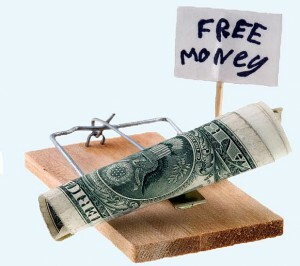 Too many people fall victim to get rich quick schemes. Don’t allow yourself to be one of these people. Protect yourself and your hard earned money from the con artists running these scams by keeping the above tips at the forefront of your mind.